Very often, if you only want a wrap hemmed, you can call your local dry-cleaners as a first resort, as they nearly always employ a tailor for alterations, and hemming a wrap will be quick work for them. 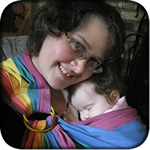 If no one in your area can do so, I can rehem for you -- use the option "Existing long wrap made shorter, no sling made". I can also shorten a ring sling with the option "Existing sling, needing hemming". If your wrap has a taper, I will cut and hem it with the corresponding taper. I will also move the middle markers if the wrap has them. You will get a status update from the cart when I receive your wrap. To ensure that this and other status update messages do not end up in your email spam folder, please add info@sleepingbaby.net to your whitelist (Yahoo and other email providers will often route these status emails to spam otherwise), or check the spam folder for messages. If you are splitting a wrap with another person, please order each portion separately. If you include both in the same order, shipping will be incorrect and I will have to send an invoice for the additional costs required. It really slows the process down if I have to invoice for shipping, and having both in the same order makes it more of a chore for me to ship things as well. Wrap description Name, color, and other identifying characteristics. Wrap being sent by Please enter sender's name if it differs from the buyer's name. Please select only once per order, not per product. That is, if you have two slings in your order, select insurance value on only one sling for the total value of the package. If you select $0-50 twice, the package will be insured for $50, since it costs nothing for up to $50 and $2.75 for $100. Several new options here. If you are having a wrap split and there will be at least 2.6-2.7m left after cutting the sling (use the calculator to find out), I can hem a shorty with the remainder. This includes re-tapering to match the original and moving the middle markers. If you just want a long wrap cut shorter, that's the second option. If you have a ring sling and it needs shortening, that's number three. If you've got at least 55-60" left after cutting a sling (or shortening a wrap), I can make a scarf; this includes cutting it to a narrower width and hemming as well (please indicate how wide you would like it). For any other details I will need to know when sewing, please use this box even if we have previously corresponded about the details of your sling; I use the order sheet, not emails, to do my sewing. However, you do not need to repeat the information in the "additional information" section at checkout. This also means that if you don't write something in the "special instructions" box, I am unlikely to remember to do it, so please be thorough when placing your order! If you email afterwards, I might remember to change your order, but I might not be checking emails, and I have unfortunately missed requests that came in via email after the order was placed. If you select "yes" for this question, I will assume that your order is correct as it stands. If you haven't actually read it but have submitted the order anyway, I cannot be held responsible for perceived errors that could have been prevented by reading the info page. If you have read the page and still have questions about selecting options, please email me for clarification before you place your order.